Back around the year 2000, my whole world broke wide open. I went to my first Functional Medicine seminar and learned about the role that the adrenal glands play on basically every function in the body. In other words, if your adrenals don’t work, nothing else will either. 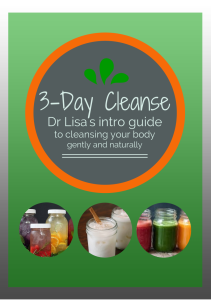 You may feel tired and toxic, gain weight, possibly suffer from insomnia, depression or anxiety, have pain in your body, get headaches, have asthma or allergies and a weak immune system. . .just to name a few. The adrenal glands are small structures that sit on top of the kidneys. They secrete hormones into the blood stream to help your body deal with and adapt to stress. When you experience stress of any kind, your adrenal glands should respond by secreting these hormones in order to help your body deal with that stress. 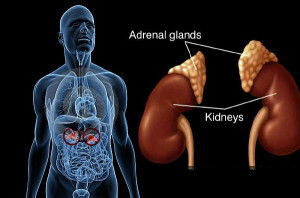 Adrenal hormone levels should rise and fall throughout the day, then they should return back to normal once the situation has been dealt with. However, in this day and age, the amount of stress we face is overwhelming to our systems. It is quite common for the adrenal glands to pump out extraordinary levels of stress hormones just to deal with day-to-day life. With this increased demand, eventually the adrenals may no longer be able to produce the amount of stress hormones needed, leading to adrenal fatigue or failure. This is not an exhaustive list, but these are the most common indications that lead me to conducer adrenal dysfunction. Symptom surveys can be great for identifying adrenal dysfunction, but they cannot definitively determine whether your adrenals are in hyper-function (stressed and requiring an elevated hormone output) or hypo-function (so worn out they can’t keep up with demand). Not only that, but there are so many patterns of adrenal dysfunction that testing is required in order to create an appropriate roadmap back to health. The test I prefer to use is called the Adrenal Stress Index and it is available through Diagnose-techs Lab. It involves collection of saliva samples at 4 different times throughout the day. These samples, collected in plastic tubes, are sent to the lab where they are tested for cortisol, DHEA, Secretory IgA (a gut immune marker), gliadin antibodies (to see if your body reacts to the proteins in grains – a common adrenal stressor), pre and post prandial insulin levels (to see how well your body handles blood sugar), and 17-hydroxy progesterone. 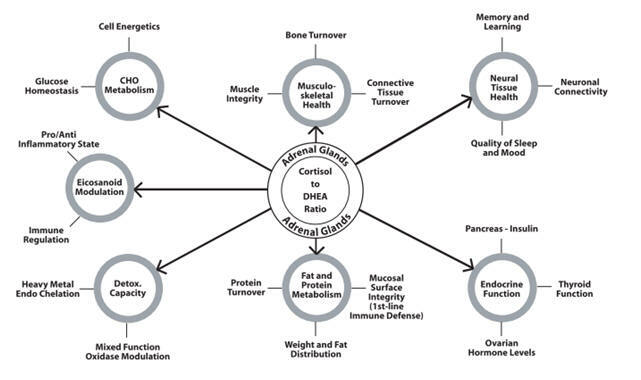 The cortisol and DHEA are mapped so your levels fall into one of 7 categories. From there, we can determine the best course of action for you to get your adrenals healthy and working again. In a future article, I’ll go deeper into the kinds of supplements used to support the adrenals. I also have an article coming out soon about Ending the Blood Sugar – Adrenal Rollercoaster. Like The Health Dimension’s Facebook page to see all of these posts and more. You can also check out our Adrenal Health Program in The Health Dimension’s Online Shop.